Volvo won't be selling any more station wagons in America. The station wagon, whose sales rose from 29,000 in 1946 to 707,000 in 1965 has joined the Dead Hub Cap Society. I don't actually miss our Volvo wagon. It had been a lemon because new features were added without enough testing. But I grew up on station wagons. We were the recipients of my grandfather's cast-offs and my father hated to part with a vehicle. So at one point in the mid-fifties, my parent's collection of vehicles in Philadelphia and at their farm in Maine included a 1952 DeSoto station wagon (the first new car my father had purchased since 1938), a 1948 Chrysler New Yorker, a 1946 wooden Plymouth station wagon, its 1941 forerunner, a 1946 six-wheeled Army truck, a 1939 laundry van, plus my father's four door 1938 Cadillac convertible and my mother's 1936 Plymouth. In 1955 I drove to college in the then 14-year-old Plymouth wagon and little concern or surprise was expressed when the front hood flew up at 60 mph on the New Hampshire Turnpike. The bent hood was secured with a jury rig and the car continued in service. There were, however, limits. 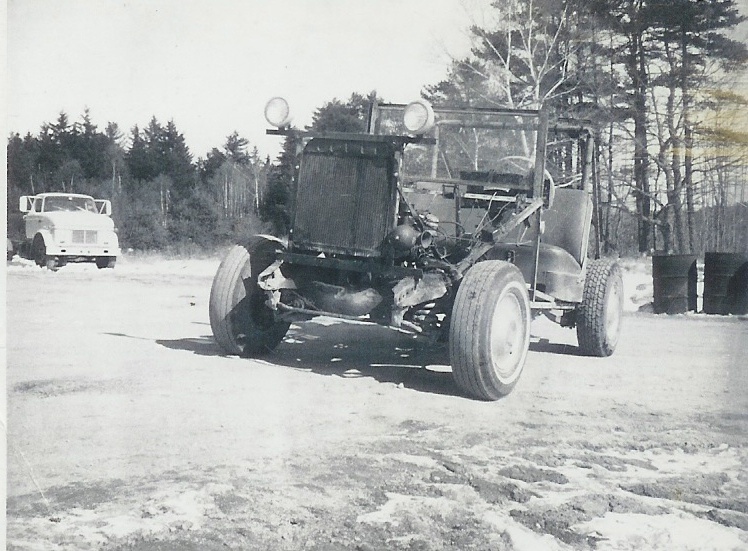 When the DeSoto, with more than 100,000 miles on it, lost its front wheel on the Maine Turnpike, it was reluctantly retired as a pleasure vehicle. At the age of 14, I learned to drive in the Army truck. I was double-clutching and shifting into six-wheel drive and using a winch to haul things out of places long before I was able to drive legally on Maine roads beyond the farm. My brother recalled, "You couldn't go directly from one gear to another but had to go into neutral first, let the clutch all the way out and accelerate or brake the motor before shifting again, depending on the direction of the shift. The maneuver also required one to take into account the load on the truck, its speed and the grade of the road." The Army truck was just one of a fleet of amazing vehicles that kept my parent's farm going, ranging from the practical to the insane. For example. my father obtained the local Railway Express truck from Clarence Bolster, a familiar figure at the local railroad station. It was, however, short on brakes. Asked how one operated such a vehicle, Jim Degrandpre, son of the farm manager, told me, "You planned ahead." 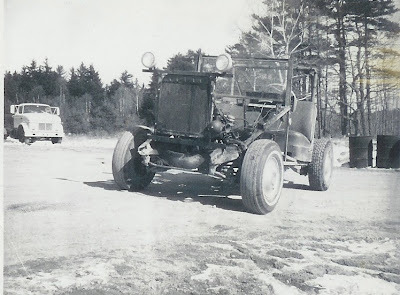 Jim's brothers, Richard and David, converted the DeSoto wagon into a monster tractor, one of several such homemade vehicles. I followed in my father's tradition. My first car was an Olds - a 1941 - was bought in 1961 literally from a little old lady who only drove it on Sundays. It had 26,000 miles on it, still smelled new, and featured a Hydromatic Drive. Unfortunately the final attribute lasted only about six months. I replaced it with a 1956 Chrysler New Yorker, which I called Gloria, because it was such sick transit. Then I got into station wagons with another Olds, which was in an accident that necessitated a complete paint job. Unfortunately, I did not make my intentions adequately clear and the whole vehicle was repainted red, including the grillwork. Its successor, the Volvo station wagon, didn't run when it was cold, hot, or wet and was quickly replaced. In 1985 I moved up from station wagons to a Plymouth minivan, which both my sons considered too embarrassing to use for dates. I would own two such vehicles and among their many attributes was the fact that thieves, like my sons, didn't like them. I only bought the second one nine years later because the first one had collided with a cow. The bovine miscreant had wandered from behind some bushes onto Virignia's Route 237, exploded into the frame of my windshield, rolled over, careened off the front fender and scudded by, pausing only long enough to look me directly and critically in the eye. The cow then completed its original mission -- namely to cross the road and enter the pasture on the other side. My wife and I were wearing seat-belts and so the encounter between a Plymouth Voyager doing 40 mph and a 1300-pound cow doing 2.5 left us stunned but mobile. We stepped out of the car and were soon joined by a state trooper, the local rescue squad, a fire engine, a sheriff's deputy as well as a small swarm of men wandering silently with transmitters in the night. Having quickly, almost perfunctorily, ascertained our good health, the rescuers asked which way the cow had gone. We pointed towards the field and most of the figures in the dark, much as the cow before them, rapidly faded into the pasture as though they, too, had been interrupted in their true errand. Later, other problems developed. Our Honda was stolen twice. The first time it disappeared from a parking lot right next to the Brookings Institution. The DC constabulary said we would never see it again but at 11:30 that night I was awoken by the Prince Georges County police with word that it had been located at a public housing project recently in the news for the frequency of its murders. We were invited to retrieve it promptly or it would be taken as evidence in a drug bust. Which is why, at 1 AM, my wife and I found ourselves in a parking lot in the most dangerous locale in the Washington region. In the trunk was a six pack of beer, so we came out about even. The second time, no one found the Honda . . .
And finally, in February 2009, just six months before I moved to Maine, my wife's 1995 Cirrus was stolen for the third time. It had lived a good life and so I wasn't too concerned until May when I received a notice from the Department of Motor Vehicles - which apparently had no ongoing relationship with the Police Deaprtment - stating that I had failed to pay four recent parking tickets on the car. Since the location of the offense was only a few blocks away I quickly drove there and found my car with tickets jammed under the windshield wiper and the front lock clearly mangled. The DMV, to its credit, did eventually decide I was not responsible. Of all these vehicles, though, my favorite remains the station wagons. I even got my sons to accept a wagon formerly owned by the IRS as their college vehicle. It not only made innumerable campus trips but two and half treks across the nation before dying in Moab, Utah. Station wagons combined the great American ideals of adventure, space and practicality. It was a car for an America that still had dreams.